William Bounds was founded in the US in 1963. 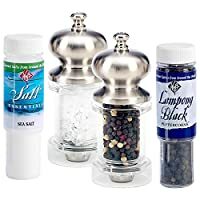 They have been at the forefront of innovation for salt and pepper grinders for over 40 years. Their products are designed to be productive and long lasting. Check out their lifetime warranty. If you’re a serious cook and want a grinder to match your passion then William Bounds is the choice for you.